No matter where you drive in Georgia, from winding rural farm roads to the crush of traffic in downtown Atlanta, the risk of a car accident is ever-present. Car crashes are a leading cause of serious personal injury and death, both nationally and in the Peach State. But the mere occurrence of a crash or injury or even death does not ensure you will receive compensation. Injury law is more complex than it may appear at first blush. Atlanta car accident attorney Stephen M. Ozcomert can help guide you through the process. It involves proving the other party was negligent (i.e., he/she breached a duty of care, directly causing the crash that resulted in your injuries). With more than two decades of success in personal injury law, our skilled legal team is well-versed in applicable statutes and case law, as well as the local players in the Georgia civil justice system. Auto insurance companies may have sappy slogans, but the truth is, they aren’t on your side. 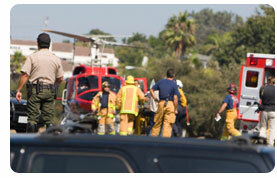 We are committed to helping you obtain a fair settlement or verdict following a car accident. Read on to learn more about your rights after a serious crash. The annual fatality rate of car accidents in Georgia has risen steadily in recent years. The Georgia Department of Transportation (GDOT) reports a five-year average of more than 1,555 traffic fatalities on our roads every year. That’s at least four daily. It doesn’t account for the thousands more serious injuries requiring emergency treatment, surgeries, follow-up therapies and lost time at work and school. To recover damages for these losses, you can take legal action against the at-fault driver. Georgia is an “at-fault” state when it comes to auto insurance claims. This is traditional tort insurance, which means negligent drivers are responsible to pay for traffic accidents they cause. It also means that persons injured and seeking compensation must prove the other driver was to blame. Some drivers do carry medical payments coverage as part of their own policy, which allows them to seek some amount of coverage for medical bills regardless of fault. That isn’t required under Georgia statutes, and it won’t stop policyholders from pursuing claims directly against the at-faulty party. Property damage liability - $25,000 per accident. One’s own uninsured/ underinsured motorist coverage can provide additional coverage in the event the at-fault driver is not insured, not identified or lacks enough insurance to fully cover your damages. Proving fault in Atlanta auto accidents means showing the other driver was negligent. All drivers have a duty of care to operate their vehicle in a reasonably safe manner. Your injuries resulted in compensable damages. Sometimes, fault may be quite clear, as in when the other driver was drunk, as defined in O.C.G.A. 40-6-391 or texting in violation of O.C.G.A. 40-5-241.2. If fault is disputed, expert witness testimony may be necessary offer a detailed explanation to prove the other driver was in the wrong. This usually includes crash reconstruction. In cases where the driver violated one of Georgia’s Uniform Rules of the Road, we may be able to establish negligence per se, or negligence as a matter of law. However, this does not conclusively establish civil liability, as one must still prove defendant’s negligent act/ omission was the proximate (direct) cause of the accident and your injuries. In some crash cases, there may be more than one liable defendant. It could be an underage drunk driver as well as the vendor who sold him alcohol (per O.C.G.A. 51-1-40, Georgia’s dram shop law). It could be the speeding motorist as well as the municipality that failed to address a dangerous condition in the road. Per the Family Purpose Doctrine, which holds the owner of a vehicle vicariously liable for injuries caused by someone else’s negligent driving, you could sue the car owner as well as the driver. (See Wingard v. Brinson, 1994, Georgia Court of Appeals.) If the negligent driver was working or acting in the course and scope of employment at the time of the collision, the doctrine of respondeat superior (Latin for “let the master answer”) may allow you to seek damages for vicarious liability from the driver’s employer. Alternatively, the employer may be directly liable for negligent hiring or failure to adequately supervise. You might also assert a product liability claim if there is evidence the vehicle you were in or the one that hit you was in any way defective, causing the crash or exacerbating your injuries. An experienced injury lawyer knows the importance of careful pre-suit investigation of your case to identify all these issues and potential causes of action. Once you establish negligence, you move on to the damages portion. The severity of your injuries would determine the complexity of this. It’s not uncommon for auto insurance companies to reach out to you immediately and pressure you to sign a settlement agreement. Understand that if you do that, you are likely forfeiting any future claims. Your best bet is to wait until consulting with an injury attorney, just to make sure at the least the offer you’re getting is fair. Punitive damages may only be available pursuant to O.C.G.A. 51-12-5.1, when there is clear and convicting evidence defendant’s actions showed willful misconduct, malice, fraud, wantonness, oppression or an entire want of care that amounts to conscious indifference of the consequences. The purpose of a punitive damage award is solely to punish, penalize or deter a defendant. Alternatively, compensatory damages are solely intended to compensate victims for their losses. Defendants in Georgia crash lawsuits will often counter that you were at least partially to blame for the crash. This is called comparative fault. O.C.G.A. 51-12-33 establishes that Georgia follows a system of modified comparative fault with a 50 percent bar. In other words, you can still claim damages from another driver even if you were partly to blame, so long as you weren’t 50 percent or more at-fault. Your damages will be reduced proportionate to your own comparative fault. For example, if you were 20 percent at-fault, you would only be entitled to collect on 80 percent of your total damages. It’s important to act swiftly because Georgia’s statute of limitations on personal injury claims is just 2 years from the date of the accident. At our Atlanta injury law firm, we recognize that this is a great deal of information for many crash victims to take in, particularly as you are recovering from serious injuries or the loss of a loved one. We work to simplify the process and fight for a fair outcome.